Neil | English, ESL -- and more! I have several blogs here; the oldest (now an archive) is Floating Life Apr 06 to Nov 07 (http://ninglun.wordpress.com/). My "ninglun" name is just Mandarin for Neil. I had a Geocities site beginning some time around 2000-2001. 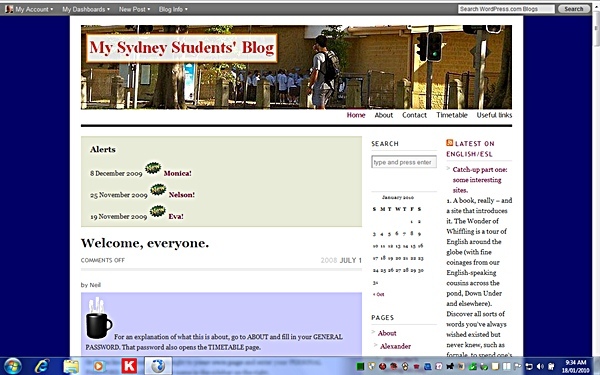 Some important elements of the English/ESL site have been stored there, but Geocities is closing in October 2009. I have managed to rescue those posts here. You can see them in the Pages Guide in the sidebar, and also listed below. The tedious business of correcting links from here to Geocities follows! It introduces the main idea of your essay. A good opening paragraph captures the interest of your reader and tells why your topic is important. 1. Write the thesis statement. The main idea of the essay is stated in a single sentence called the thesis statement. You must limit your entire essay to the topic you have introduced in your thesis statement. 2. Provide some background information about your topic. You can use interesting facts, quotations, or definitions of important terms you will use later in the essay. In exams you need to analyse the question very carefully and decide what your major points are going to be. Then you can write a good introduction. Outside exams, I have found, things may work a little differently. You still need to analyse the question. How else can you be sure your essay is relevant? On the other hand you can begin a draft anywhere – a middle section for example, if that has material you are confident about. The whole essay may grow, like a movie being made, out of order. Later you can fit it all together, edit for cohesion and flow, and write an introduction to fit what evolved. Or you might draft straight through from beginning to end. I have in the past done it both ways, or written an introduction first and then jumped to various sections. I almost invariably find myself revising the introduction very heavily as it sometimes contains more than it should, or your actual writing may have changed the order the introduction outlines. I have been foolish enough to promise a “model essay” for Module C. Now beware of model essays. They are just what they say they are – suggestions. They are not one size fits all perfect essays, and they should never be learned off by heart. They may even, with the best intentions, be bad models. So read them critically and learn from them, but your essay must be YOUR essay, not mine! “When composers embed conflicting perspectives in their work they are simply reflecting the way we process events, personalities and situations in real life. To study how composers do this enhances our own responses.” Has this been the case with the texts you have studied for Conflicting Perspectives? Refer to your set text and TWO texts of your own choosing. It is often said that conflict of some kind is at the heart of every narrative, especially in the tight narratives needed in a play like Shakespeare’s Julius Caesar. There are certainly conflicting perspectives on situations, events and characters in that play. Referring to three key scenes we will find how Shakespeare has created those perspectives. In a very different genre, the short story, a conflict of perspectives is at the heart of Ding Xaoxi’s “The Angry Kettle” (in Maidenhome, Melbourne 1993). This story shows that conflicting perspectives are not always matters of power or life and death but may create humour, which may also be seen in the conflicting perspectives embodied in the film Priscilla, Queen of the Desert. In all these examples studying how the perspectives are created does make the texts richer and sharpens awareness of how such conflicts play out in life. It is often said that conflict of some kind is at the heart of every narrative, and behind and within the poems in Birthday Letter Ted Hughes grapples with a range of conflicting perspectives, some of them internal, on the tragic outcome of his marriage to the poet Sylvia Plath. There are certainly conflicting perspectives on situations, events and characters in these poems. Referring to two poems, “Fulbright Scholars” and “Your Paris”, we will find how Hughes has created those perspectives. The movie Sylvia (2003) is especially interesting as it draws on the same situation, but the perspectives are different and the way they are created is very different. In quite another genre, the short story, a conflict of perspectives is at the heart of Ding Xaoxi’s “The Angry Kettle” (in Maidenhome, Melbourne 1993). This story shows that conflicting perspectives are not always matters of life and death but may create humour. In all these examples studying how the perspectives are created does make the texts richer and sharpens awareness of how such conflicts play out in life. It is often said that conflict of some kind is at the heart of every narrative. This is true of David Guterson’s Snow Falling on Cedars. There are certainly conflicting perspectives on situations, events and characters in this novel. Referring to three key episodes we will find how Guterson has created those perspectives. In a tighter genre, the short story, a conflict of perspectives is at the heart of Ding Xaoxi’s “The Angry Kettle” (in Maidenhome, Melbourne 1993). This story shows that conflicting perspectives are not always matters of power or life and death but may create humour, which may also be seen in the conflicting perspectives embodied in the film Priscilla, Queen of the Desert. In all these examples studying how the perspectives are created does make the texts richer and sharpens awareness of how such conflicts play out in life.